Mississauga Pakmen graduate Sharone Vernon-Evans has leapt from prospect to blue chipper, to burgeoning star on the world stage of volleyball all in a matter of weeks . While most athletes train for seemingly a lifetime to one day be lauded and revered by fans, Vernon-Evans is already being acclaimed an all-star. The 19-year-old Scarborough native made an impact on the world stage at the 10-team NORCECA Men’s Continental Championship earlier this month (Sept. 26-Oct.1) at the U.S. Olympic Training Center in Colorado Springs where he played a pivotal role in helping Canada qualify for the World Championships. Vernon-Evans and his teammates picked themselves up after a disappointing 3-0 loss to their American hosts in the semi-finals to defeat Mexico 3-1 for the bronze medal and a ticket to the 19th edition of the FIVB Worlds slated for Italy and Bulgaria September 10-30. Outside hitters Nick Hoag and Stephen Maar led Canada in scoring against Mexico with 18 points apiece, while Vernon-Evans added 17. Canada had earlier defeated Saint Lucia 3-0 (25-9, 25-13, 25-8) and Trinidad & Tobago 3-0 (25-21, 25-12, 25-10), backed by Vernon-Evans’ 15 points and match-high four blocks, giving officials plenty of time to notice the immense talents of the 6-foot-9 Pakmen alumnus, who was named the Best Opposite Spiker of the tournament. Of the 10 awards presented, Vernon-Evans and Best Outside Maar of Aurora were the lone Canadians to be acknowledged. 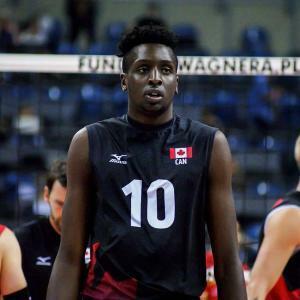 While obtaining an impressive collection of sparkling international bronze medals, beginning with the Junior NORCECA Championship, Junior Pan-Am Cup and FIVB World League and now the NORCECA Continental Championship, the Agincourt Secondary School graduate continues to take it all in while learning on the job. This time around, it was learning to excel against world-class opponents in the mountain-high thin air of Colorado. Vernon-Evans adds he and his teammates would have loved knocking off the U.S. at their home in the OTC Sports Center, but their main priority was earning one of the three qualifying spots that were up for grabs. Rebounding after an opening set 25-21 loss to Mexico and fighting back with 25-13, 27-25, 25-18 wins, was a testament to the confidence and experience this young Canadian side is gaining each time out. “I just think we started off flat,” concurred Vernon-Evans, “but we picked it up and found our rhythm in the second set. 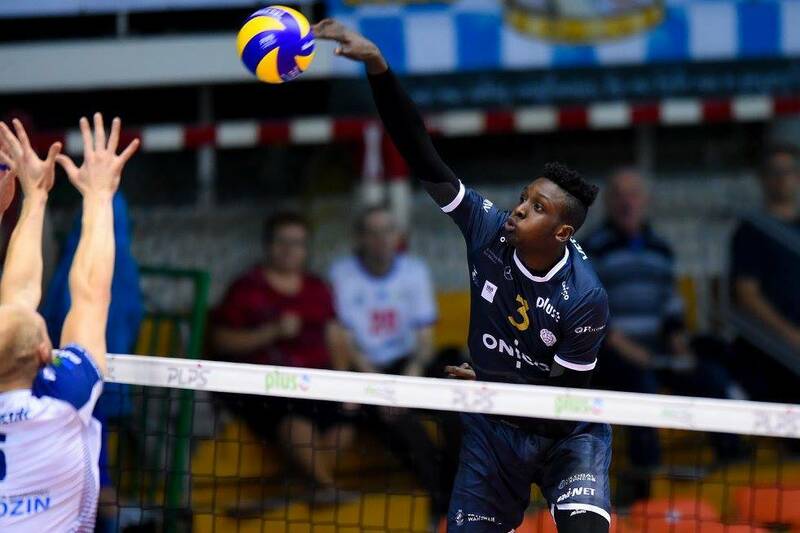 No doubt those elements of his game will continue to grow under the tutelage of Canadian coach and former French star Stéphane Antiga, who also happens to be Vernon-Evans’ coach for the professional club team ONICO Warszawa in the 16-team Polish Plus Liga. Having already experienced living on his own in Gatineau when Vernon-Evans moved to Quebec to attend the national training centre, Vernon-Evans is lapping up the experience with the innocence and wide-eyed enthusiasm that befits his age. Who knows, it may not be long before Vernon-Evans starts inviting his Polish teammates, French Nationals Antoine Brizard and Guillaume Samica, as well as Macedonian Nilola Gjorgiev to dinner for some Polish specialties like Pierogis, Bigos, Golabki and Schnitzel. Until then, Vernon-Evans will take each day as it comes in the bustling hub of Warsaw. “I have not been lost yet thank god, but I am trying to go on walks and explore. No doubt there will be plenty of time in the coming weeks and months to explore Krasinski Gardens, The Royal Castle, Lazienki Palace, the Warsaw Uprising Museum and the National Museum, but for now the focus remains volleyball. And speaking of games, Vernon-Evans says he is wholeheartedly embracing the opportunity to play professionally in a foreign land. And with a capacity of 4,824 fans, Torwal Hall may soon ring with the name, “Sharone! 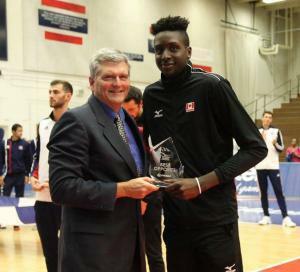 Sharone!” as his adventure into professional volleyball continues. For there’s no doubt that the fans will take a liking to the impressive young Canadian, much like his coach Antiga has. Having started the season with a 2-2 record with another match against KS Espadon Szczecin looming on Oct. 18 Vernon-Evans will continue improving with fellow youngsters Bartosz Kwolek, 20, Jedrzej Gruszczynski, 19, and Jan Firlej, 21.